This post has been sponsored by Carapelli®. All thoughts and opinions are my own. It’s no secret that I’m an all or nothing kind of girl. I’m either wearing alllllll the latest trends at once or I’m sticking to a basic jeans and tee look. I’m either practicing my latest hobby every night for 6 months or I’m not touching it for 6 years. I’m either listening to my favorite songs on repeat for days at a time, or I’m probably listening to nothing at all. I’m either loading my food up with all kinds of seasonings/flavors/toppings or I’m eating a salad with a simple oil and vinegar dressing. Recently, I even carried this all or nothing attitude over to my focaccia. I either want it nice and simple (Hey, olive oil and sea salt!) or I want it loaded up to the max. Of course, it depends on if I’m eating the focaccia by itself, or alongside a soup or salad, or if it’s just the accompaniment for a bigger meal. Loaded focaccia is certainly not always the answer. But today, today it is most definitely the answer. Now, I know at first glance this focaccia recipe may seem like it is nothing overly special. But look beyond the dough, because the Carapelli® Unfiltered Extra Virgin Olive Oil and toppings are where all the magic happens. The bread itself is simply a vessel elevated by everything added on top. And I do mean everything. 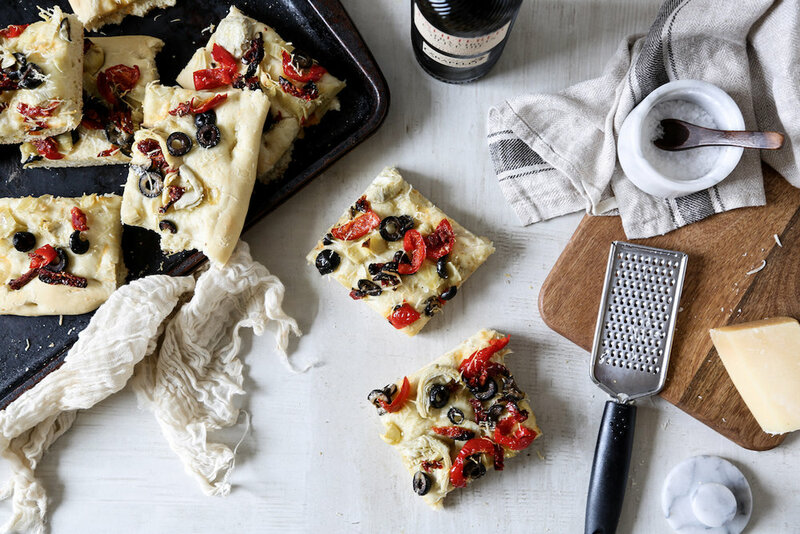 After all, there are just so many great focaccia toppings out there. Why limit yourself to only one or two? 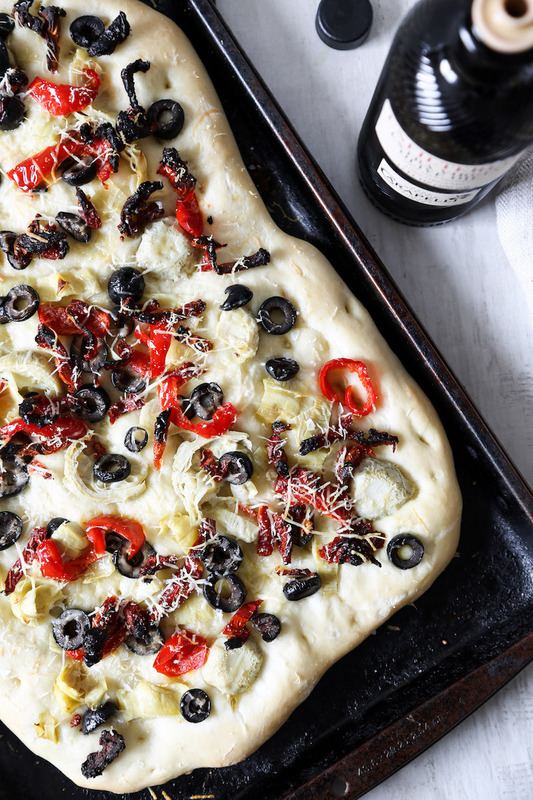 Why not combine them all into one epic, loaded focaccia, like this one, chock full of sun-dried tomatoes, black olives, artichoke hearts, hot cherry peppers, parmesan cheese and plenty of olive oil? While I’ve emphasized the number of toppings involved in this recipe, I also want to point out how truly simple this recipe actually is. Additionally, the ingredients are all high quality, and using Carapelli® Unfiltered Extra Virgin Olive Oil (which you can grab at your local ShopRite, right alongside everything else you need to make this recipe), as opposed to using another oil or butter, means you’re sneaking in the benefits of a healthy fat (Bonus points for dipping the focaccia in a little extra olive oil when eating it.). And while we’re on the topic of the olive oil, as an FYI, both the unfiltered and organic olive oils would work for this recipe. However, I chose to use the unfiltered oil because its warm and nutty flavors really round out and tie together the other ingredients to make one vibrantly seasoned bread. The rich texture of the oil combined with the dense and fruity notes work to enhance all of the flavors in a natural way that a way that is reminiscent of a simpler time and a simpler recipe while simultaneously accounting for a modern flavor palette. To me, this recipe is the way a recipe should be: satisfying yet healthy, rustic yet refined, fresh and pure but full of flavor, simple yet elevated. Oh, and did I mention you can get everything you need to make it all in one store? But seriously. You really can pick up everything you need, including Carapelli® Unfiltered Extra Virgin Olive Oil (found in the baking aisle) along with ShopRite Olives and Cherry Peppers (found in the canned goods aisle) right at your local ShopRite. Even better, if you use this Ibotta coupon offer, you’ll save on your purchase of Carapelli® Olive Oil September 27th through November 3rd. I mean, a recipe just doesn’t get easier or better than this. 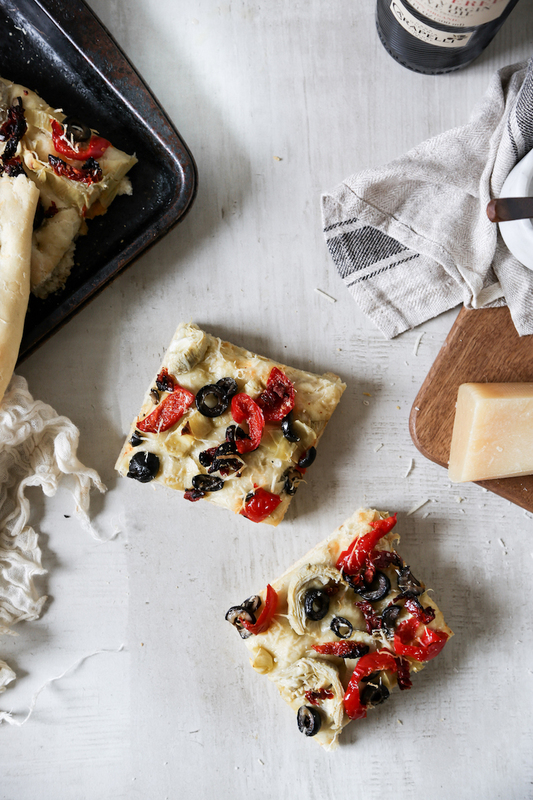 Now, I’d love to know, what’s your favorite focaccia topping? Do you prefer something simple or do you like your focaccia to be loaded up? To the bowl of a stand mixer, with the dough hook attached, add the warm water. Sprinkle the sugar and yeast on top, then stir a few times to combine. Allow to rest for about 10 minutes, or until the yeast foams up. Turn the mixer on to low speed, then add the salt and olive oil and mix a few seconds, before gradually adding the flour, about half a cup at a time. Once all the ingredients are added, turn the speed up to medium and continue mixing for about 5 minutes. The dough should be clinging to the hook and only slightly sticky. If it’s too sticky, continue adding more flour, about 2 tablespoons at a time, until it no longer clings to the sides of the bowl. Remove the dough from the bowl, lightly shape it into a ball, lightly grease the sides of the bowl and place the dough back in. Cover with a damp towel and place in a warm spot (a sunny window, the top of your stove, etc) for about 50-60 minutes or until the dough has risen and doubled in size. Remove the dough from the bowl and place it onto a lightly greased baking sheet. 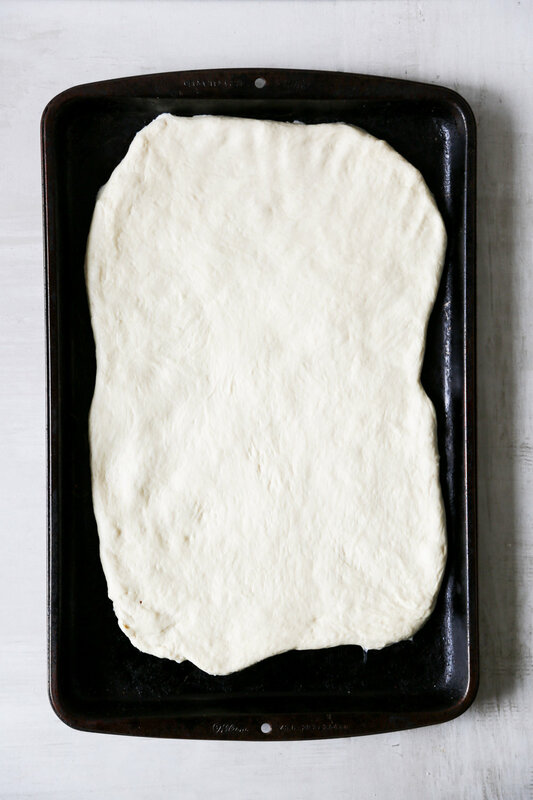 Use your hands to spread the dough out to about ½ “ thick. There’s no need for perfection here...if the dough isn’t an exact rectangle or doesn't completely fill the pan, that is ok. It’s part of the rustic charm of this recipe. Use your fingers to press deep dents into the dough (you should be able to slightly see the pan through the dents, which I know seems weird, be trust me, the dough will rise back up a bit). Drizzle with olive oil, sprinkle on your toppings, finishing with the cheese and a sprinkle of sea salt. Heat your oven to 400 degrees. Place the focaccia on top of the stove to rest and rise until the oven is heated. Then, bake for 18-20 minutes or until the focaccia is cooked through and the edges and cheese are golden brown. Slice into squares and serve. This tastes best served fresh from the oven. However, leftovers can be stored wrapped in foil or a ziplock bag, in the refrigerator, for up to two days.